It's taking some time add the 1,000,000+ products we offer to this website, so please use the catalog page files below as a guide for CasterDepot has available for purchasefrom FootMaster Casters & Wheels. The file for the entire catalog is quite large, so it has been broken it down by each series of caster and wheels to save you some time when viewing. 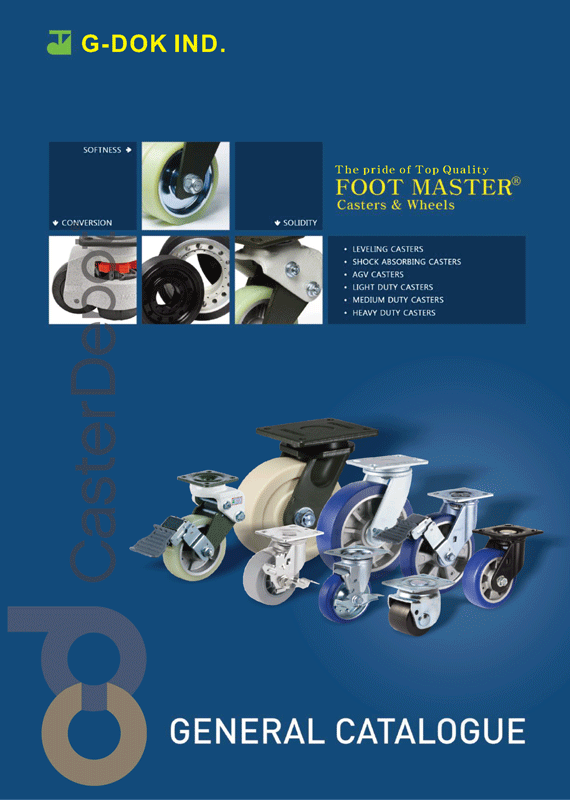 View the entire FootMaster Caster & Wheels Catalog. FootMaster GD Series leveling casters catalog pages. FootMaster GDN & GDR Series leveling casters catalog pages. FootMaster SGDN Series stainless steel leveling casters catalog pages. FootMaster GDS Series shock absorbing casters catalog pages. FootMaster GDSD Series dual wheel shock absorbing casters catalog pages. FootMaster GDSP Series heavy duty shock absorbing casters catalog pages. FootMaster GSST Series towable shock absorbing casters catalog pages. FootMaster G Series fine shock absorbing casters catalog pages. FootMaster GXTD Series heavy duty dual wheel AGV casters catalog pages. FootMaster GSAD Series dual wheel and dual swivel head AGV casters catalog pages. 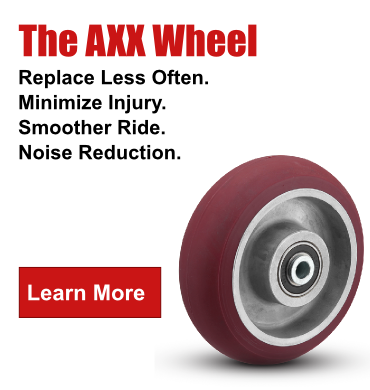 FootMaster GXTS Series medium duty shock absorbing AGV casters catalog pages. FootMaster GXTA Series medium duty AGV casters catalog pages. FootMaster GLH Series heavy duty low profile casters catalog pages. FootMaster JS Series heavy duty low profile casters catalog pages. FootMaster PL Series heat resistant casters catalog pages. FootMaster SGL Series stainless steel light duty casters catalog pages. FootMaster SPM Series stainless steel medium duty casters catalog pages. FootMaster GL Series light duty casters catalog pages. FootMaster PL Series light duty casters catalog pages. FootMaster P Series light duty casters with thread guards catalog pages. FootMaster GDC Series light duty casters with thread guards casters catalog pages. FootMaster GDD Series light duty furniture and chair casters catalog pages. FootMaster RT Series medium duty casters catalog pages. FootMaster PM Series medium duty casters catalog pages. FootMaster GH Series medium duty casters catalog pages. FootMaster PH Series medium duty casters catalog pages. FootMaster PHS Series medium duty casters catalog pages. FootMaster PMW Series medium duty casters catalog pages. FootMaster PHW Series medium duty casters catalog pages. FootMaster GF Series heavy duty casters catalog pages. FootMaster GXT Series heavy duty casters catalog pages. FootMaster GXTT Series heavy duty casters catalog pages. FootMaster UGXT Series heavy duty casters catalog pages. FootMaster FT/PT Series trolley catalog pages. FootMaster Fork Lift Master Wheels catalog pages. FootMaster Heat-Resistant Wheels catalog pages. FootMaster Injected PU Rubber Wheels catalog pages. FootMaster Light Duty Soft Polyurethane Wheels catalog pages. FootMaster MC Nylon Wheels catalog pages. FootMaster Medium Duty Polyurethane Wheels catalog pages. FootMaster Medium/Heavy Duty Polyurethane Wheels catalog pages. FootMaster Nylon Wheels catalog pages. FootMaster Roller Wheels catalog pages. FootMaster Special Purpose High Quality TDI Wheels catalog pages. FootMaster Special Purpose Premium PPDI & NDI Wheels catalog pages.